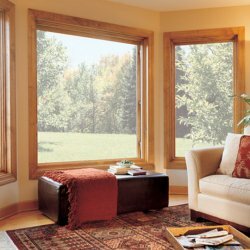 Our guide to Aluminum Clad Windows offers detailed descriptions of companies such as Marvin Windows and Doors and Hurd Millwork Company Inc..
A subsidiary of Andersen Window & Door, this company makes aluminum-clad windows and doors. Site offers photos and specifications for its many offerings, plus a dealer locator. Finally, a picture window that allows a view and fresh air, too.